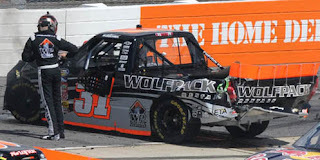 James Buescher picked up the 1st last-place finish of his NASCAR Camping World Truck Series career in Saturday’s Kroger 250 at the Martinsville Speedway when his #31 Wolfpack Rentals Chevrolet was involved in a grinding two-truck accident that ended his day after 134 of the race's 250 laps. The finish came in Buescher’s 51st series start. The 21-year-old Buescher qualified 6th for Saturday’s race at a speed of 94.529 mph, securing him a top-10 start in all three races he’s run in 2011. Although he failed to qualify for the second race of the season at Phoenix, Buescher had finished 9th at Daytona and 5th at Darlington, securing him the 11th spot in the points standings heading to Martinsville. On Friday, newcomer Billy Keyes was forced to withdraw from his first-ever Camping World Truck Series race when his unsponsored #34 Chevrolet locked its brakes during his first timed lap in Happy Hour, sending his truck hard into the inside wall along with Joey Coulter’s #22. Coulter’s Richard Childress-led crew was able to repair their truck in time for the race. Since only 36 trucks showed up to qualify, Keyes’ withdrawal made Saturday’s race the first short field of 35 trucks since last summer’s race at Nashville, 15 races ago. Early in the race, Justin Lofton looked like he would be scoring his own first last-place finish in the Truck Series. On Lap 19, Norm Benning spun him entering turn three, sending Lofton’s #77 hard rear-first into the outside wall. The accident, which brought out the first caution of the day, required nearly 100 laps of repairs to the rear clip of his Germain Racing Toyota. Lofton eventually returned to finish the race 90 laps down in 32nd. Not long after Lofton came back onto the track, two simultaneous accidents ultimately ended Buescher’s run, resulting in his first last-place finish. On Lap 137, a five-truck accident unfolded in turn one involving Nelson Piquet, Jr., Parker Kligerman, Brad Sweet, Justin Johnson, and Matt Crafton. As the field checked-up in turns three and four, Buescher and Jeffrey Earnhardt hooked bumpers in turn three, sending both trucks hard nose-first into the outside wall. While the five-truck wreck was not as serious, Buescher and Earnhardt’s wreck brought out a red flag. Fortunately, neither driver was injured. Buescher now stands 20th in the Truck Series standings, 64 behind point leader and Martinsville race winner Johnny Sauter. *No driver has qualified better than Buescher and finished last in a Truck Series race since 2007, when Jacques Villeneuve’s #27 UNICEF Toyota qualified 3rd at the 2007 Ford 200 at Homestead, then fell out in a single-truck crash 80 laps into the race. *Prior to Saturday’s race, no Truck Series driver had completed more than 134 laps since 2008, when Tim Cowen’s #42 Cowen Truck Lines Ford fell out with overheating problems after 140 laps of the 2008 Ohio 250 at Mansfield. Between those two races, no last-place finisher had completed more than 99 laps (Kvapil’s run at Phoenix last month). *The #31 had finished last in just one other Truck Series race, which came when the late Tony Roper lost the engine on his Concor Tool & Machine Ford nine laps into the 1997 Chevy Desert Star Classic at Phoenix. Roper lost his life three years later in a multi-truck accident on Lap 32 of the 2000 O’Reilly 400 at Texas. *This was the third consecutive Truck Series race where a driver scored their first career last-place finish as the result of a crash. Such a thing has not happened since the fall of 2005 when a streak of four occurred: Tam Topham at Martinsville, Mike Bliss at Atlanta, Jack Bailey at Texas, and Erin Crocker at Phoenix. Following teammate Brad Sweet’s crash at Darlington, Buescher’s last-place finish at Martinsville was the second in a row for Turner Motorsports.